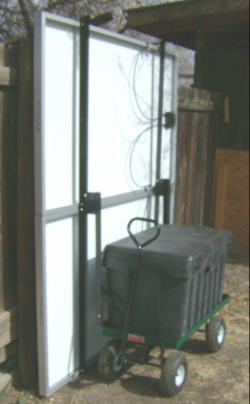 The Cart Mount System is designed to be conveniently stored against the wall of a garage or shed, until it is needed. Then it is rolled outside into position, the solar panels are tilted up and locked into position, you plug in and your emergency power concerns are over. The CM-5K is easy to move around the garage or yard and can go through a normal sized residential door, as well as any garage door.. The Trailer Mount System may be towed behind your vehicle to a jobsite, camp, or emergency situation, where you can open it up, plug in and have safe, uninterrupted power for extended periods. The TM-5K can also be easily moved around the yard or driveway by hand. 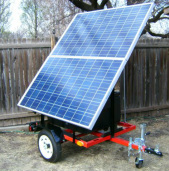 A small trailer dolly may be used for even greater ease of movement.